Just getting started with Multi PDF Converter? Read our Quick Start Guide. It’s the fastest way to get you going. Make sure you've downloaded and installed the software from our download page. First, open the program by double clicking the Multi PDF Converter icon on your desktop (Mac Users - the icon is located in your Applications folder). You may select your PDF or JPG files in one of two ways: Drag and drop your files (or a folder containing PDF or JPG files) onto the application's main window. Or, you may click the button "Click here to choose files." Note: If you are converting PDF to JPG, you may want to adjust the final image quality. Finally, choose the location (output folder) for the final converted files and click "OK". By default, the program will create a folder called "Converted Files" on your Desktop - you can always save it elsewhere. 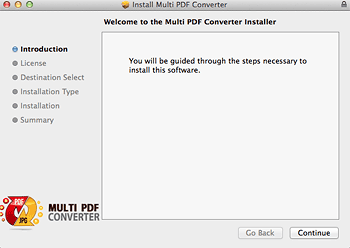 How do I install Multi PDF Converter? First, download the program by going to our Download Page and click on your operating system (Mac or Windows). 1. Click the "Keep" button. This is the standard warning for all downloadable files. 2. Click on the Installer. This will start the installation process. Continue with the installation and enjoy! This will start the installer. Follow the instructions to install Multi PDF Converter on your computer and you will be good to go! Why is there a SAMPLE mark on my pages? This is a limitation of our demo version. To permanently remove the SAMPLE mark and be able to convert more than 2 files at once, you will need to get a license key from our web store. In some cases, a user will activate the license and inadvertently try to convert a file that has the SAMPLE mark on it from previous runs. Make sure you use the original files, ones without the SAMPLE mark after you have activated the license key. I am getting errors, please help! 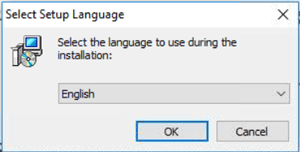 A common error you may encounter is a Java-related error and this happens when you are trying to download and install the program while you have the program already open on your desktop (this affects Windows only Users). If you are getting error codes when converting files, try using a lower resolution setting and reduce the number of files you are trying to convert. This could be a memory issue. In addition, if you are using an older version of the program, click here to download the latest version. Windows Users: Open the PDF file with Adobe Reader XI (here's a link to the free download of Adobe Reader XI). Simply double click the problematic file and now it will open in Adobe Reader X. Then save the file with a new name (File>Save as>PDF), choose a new name and location. Try re-merging the newly saved file. NOTE: This is not the same as right clicking on the file and renaming it!. If you are getting an error during the license key activation, try disabling your antivirus software or firewall to resolve this issue. Click here for instructions on how to do so. Our program has been Norton Approved. How do I activate the license key? 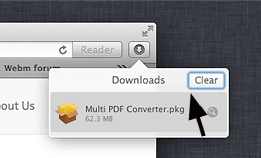 First, make sure you have downloaded the latest version of Multi PDF Converter from the download page. If you don't have your license key, you can get it here. Then, go to our activation page for instructions.